The U.K. advertising industry yesterday urged the country’s government to acknowledge its contribution to economic growth and to cut the legal red tape that is “stifling investment” in the sector. Unveiling new research from Deloitte showing that advertising contributes £100 billion ($158 billion) a year to the U.K. economy, the Advertising Association used its annual Lead summit, held Jan. 31 in London, to send a bullish message to the austerity-minded coalition government that it has undervalued advertising’s catalytic role in business growth. That message was delivered direct to its intended recipient: the summit keynoter Maria Miller, a former Procter & Gamble marketer and Grey director who, as Secretary of State for Culture, Media and Sport, is the minister responsible for advertising. Opening the conference, AA president and CEO of telecom BT Retail Gavin Patterson stressed advertising wasn’t “looking for handouts, subsidies or even government contracts," the latter a reference to draconian cuts in government ad spend after the 2010 U.K. general election. In its "Advertising Pays: How advertising fuels the U.K. economy" report, Deloitte used econometrics to calculate that every £1 ($1.58) in advertising spend generates £6 ($9.50) for the U.K. economy. Some 550,000 jobs were related directly to U.K. advertising, the survey claimed. “What advertising needs, to put it bluntly, is for government and regulators to get out of the way,” Patterson told the gathering of media, advertising and marketing leaders in London. The sector needed to be “set free” from “overregulation” to make an even greater contribution to economic growth. Though Patterson did not specify which laws he had in mind—the Committee of Advertising Practice lists more than 440 regulations that affect the creation of U.K. advertising—some agency chiefs pointed to the much-reviled Transfer of Undertakings (Protection of Employment) Regulations 2006, or TUPE, as an example. James Murphy, CEO of Omnicom agency adam&eveDDB, told Adweek that TUPE, designed to protect workers’ rights when their company is acquired or a piece of business is passed to another company, is “clearly a nonsense in a service industry like advertising.” The law requires agencies that win business from another shop to rehire those staff who worked on the original account. 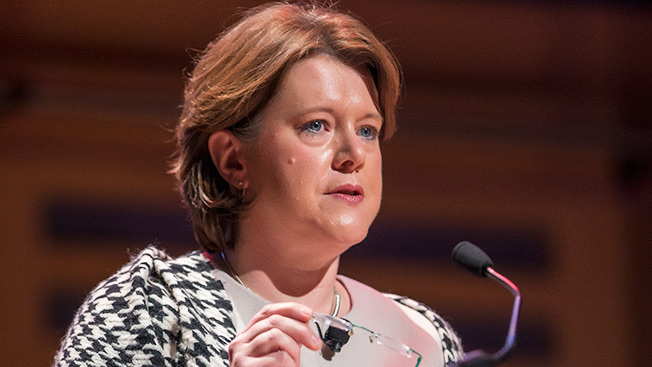 Miller promised to be the sector’s “champion and cheerleader” from now on although her address lacked specific pledges to help loosen the effects of regulation. Beattie McGuinness Bungay CEO Andrew McGuinness, who commissioned Deloitte’s report while he was AA chairman from 2009 to 2011, believes the summit, and the minister’s speech, put the ball back in the industry’s court. “Now we need to be bolder and clearer on what we want from her,” he told Adweek at the summit’s close.